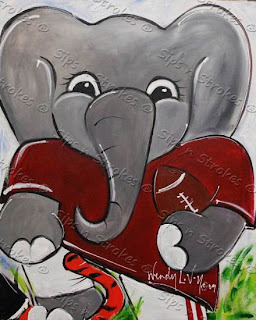 Every Friday in September is Football Friday at Sips n Strokes Tuscaloosa. Come kick off your football weekend Sips n Strokes style! We have several new images on our calendar, so sign up today and be a part of one of our Football Fridays. Also, we have added a weekday class on Wednesday the 2nd. Also, be sure to check out our new times on select Saturdays! Be sure to reserve your seat today to join us for our Football Fridays and our new daytime classes! We can't wait to see you soon! We are running a special $5.00 off class tonight (8-3-09) at our Vestavia location with no coupon needed. The discount will be applied at check in. No coupons will be accepted. Some restrictions apply.